This article was used by permission. The original can be found here. Triathlon is full of amazing people with amazing stories. One of my favorite things about the sport is that every year I meet more people with more stories. Stories of how and why they got started in the sport and stories about why they continue in the sport. For some it’s about a new challenge. For some it’s about a new lifestyle. For others it’s about channeling the emotion of a tragedy or loss into something positive. Whatever the story, they’re all inspiring. The more I race, the more I’ve become a fan of a lot of the folks I race with and against. I’m thankful for awesome groups like the Louisville Landsharks and Team VO2! A great community of folks that make a tough sport fun! I’m thankful for my wife who has supported and tolerated a lot as I have pursued this hobby! My story started as an effort to find a way to lose weight and have fun and has morphed into a journey to challenge myself and encourage others. I’ve learned that with consistency, planning and being a student of the sport, big improvements can happen and you can find yourself competing at higher and higher levels (with yourself and other competitors). 2018 was my 9th year doing triathlons and the best yet for many reasons. The 2018 season also ended up being easily my most memorable. It was a season of firsts, a season of accomplishment and not without some adversity. 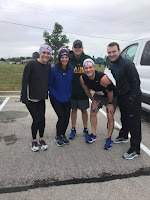 It was also the 2nd straight year I was able to race with friends from my church small group! I began planning the season in the fall of 2017 when I registered for IM 70.3 Chattanooga. I was coming off my best season so far and wanted to make sure I was doing what I could to make this one better. The first thing I did was reach out to Mike Hermanson with Progressive Endurance. Mike coached me through the months leading up to Chattanooga and helped me with my race day strategy. Along the way he taught me a great deal about training and race day nutrition. Working with Mike was a great move and it set me up not only for a great race in Chattanooga, but also for the races that followed. Without his help, I’m confident I wouldn’t have had as much success this year. 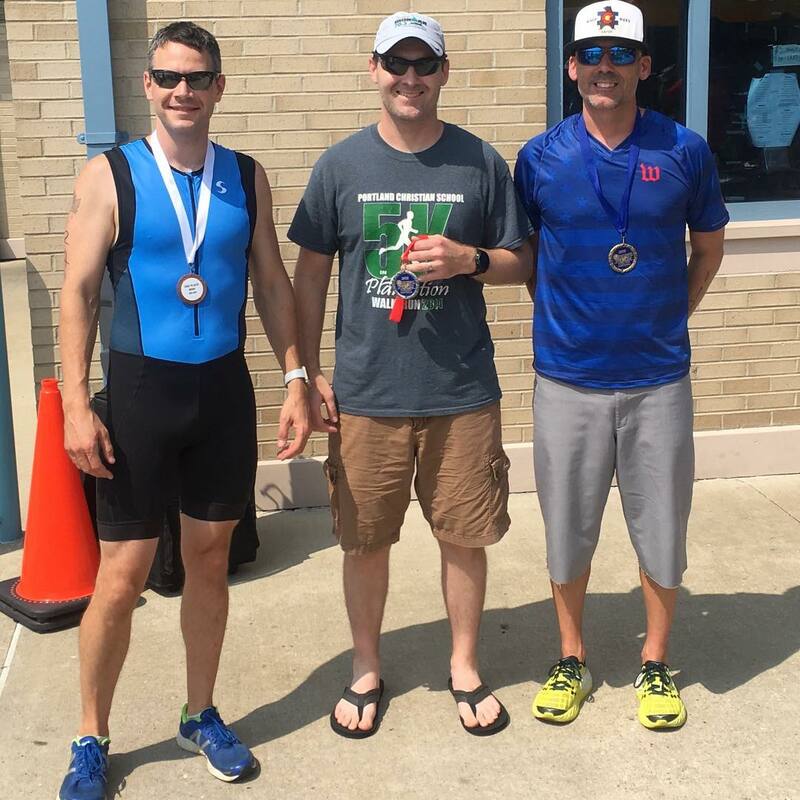 My initial plan for 2018 was Chattanooga, Tri Louisville and the Bowling Green Sprint Triathlon. 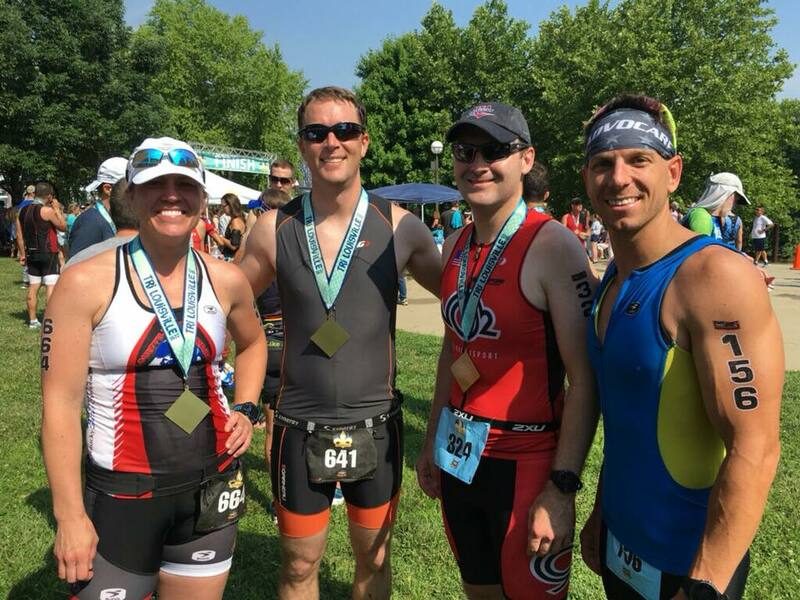 Tri Louisville and Bowling Green have become favorites of mine that I hope to do annually. Everything else was ad-hoc to the calendar. I’ve written about this in a previous post. It’s a fantastic race venue and was an amazing experience. The time is a PR at this distance, coming in about 6 minutes faster than my 2016 time at IM70.3 Austin in 2016. The swim in Austin was cancelled due to fog so this is likely closer to a 45 minute PR. 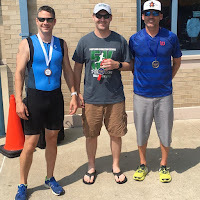 This is a PR of over 15 minutes at the Olympic Distance, beating my previous best of 2:38:50 from the 2017 Derby City Tri-Fecta. I’ll spot the river current 6 minutes and call it a 9 minute PR. Heroes Run 5k was a benefit for USA Cares that a friend of mine was promoting. I registered the night before. It was a Saturday morning race just down the road so why not. I didn’t go into this race with any specific goals other than to run hard and see how it went. This makes the 5th time I’ve done this race. This was my best race ever in 2017 and was going to be tough to top. Goal: beat 2017 time of 1:14:31, which was good for 4th in my age group and top 20 overall. 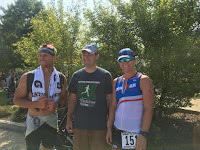 While I’m disappointed in the time, this was only the 2nd time I’ve gotten on the podium at a triathlon! When I look back at the weeks leading up to this race, I probably should have expected to have a slower overall race. 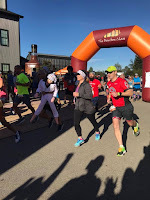 While my running had been strong and consistent, I’d spent considerably less time on the bike in prior weeks which impacted my ability to handle the hills on a tough bike course and ultimately negatively impacted my run. This race was a little extra special because my small group did so well. 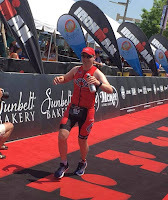 Ryan Durham finished 16th overall and won his age group. Julie Hammer came in 52nd and 3rd in her age group. 3 athletes, 3 podiums! 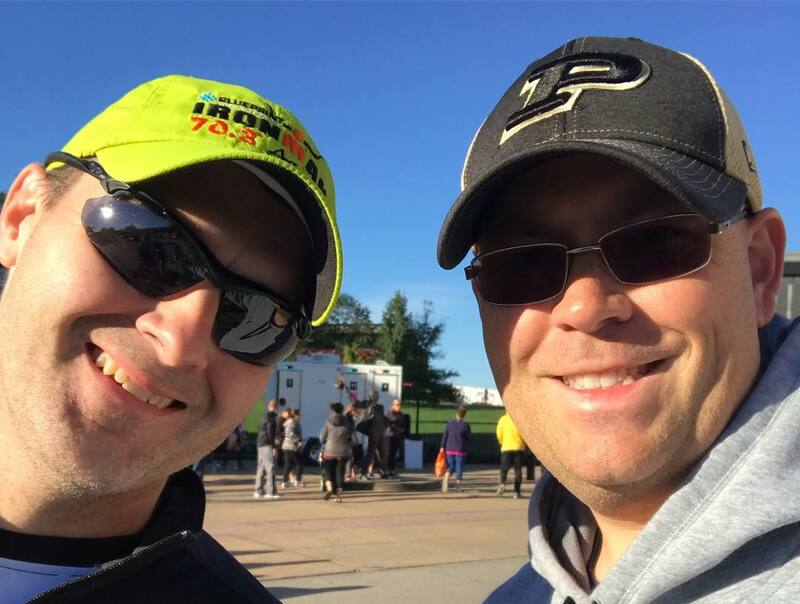 Mike Hermanson challenged me to register after seeing me muse online about whether or not I could run a 5k under 20 Minutes. This was a tough race and a race of firsts. I was on pace for my goal time of 20 minutes for the first mile, but was hit hard with some muscle cramping in my left leg that caused a lot of pain and slowed me down for the last 2 miles. With that said, I can’t be more pleased with the result. 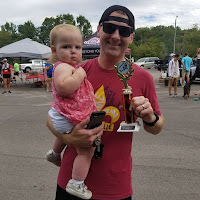 Won my age group for the first time ever in a race and ran my fastest 5k since my early 20s. It was also my first race after turning 40. The cramping in my leg turned out to be some weakness and muscle imbalance that had developed over the prior months and is something that has plagued my runs since. Swim and a tired toddler. I took the 1500m swim leg, Ryan Durham took the bike leg and Julie Hammer anchored us on the run. “The IronMan and Her Apprentices” finished 3rd. It was a fun way to cap off a tri season. This race also included a 1500 Open water Swim race. My swim time was good enough for 3rd overall in the men’s race. This was a late addition to the calendar. My friend Ben Jarboe’s team had a runner drop and he asked if I wanted to join. I love the Bourbon Chase so heck yes! Leg 1 – Started at Jim Beam and led the entire 7.1 miles to the first exchange zone. Averaged a 7:48 pace over rolling terrain and some trails. Leg 27 – 5.2 miles. I was really feeling it from the first two legs and laid off the pace a little due to tightness in my left leg (again). Averaged an 8:16 pace. The 13.1 miles at the end of IM70.3 Chattanooga was a PR at the half marathon distance (1:54:31). With that in mind, I was excited to schedule a stand alone half marathon to see what I could do without all the swimming and biking first. I registered over the summer, confident that I could beat my existing PR. With the leg issues that came up later I had my doubts on whether or not I could even finish the race. The Bourbon Chase the week before helped me to have confidence that I could cover the distance. I felt fantastic for 10 miles! So good that I was sure I could negative split the last 3.1. I picked up the pace for mile 11 and then the wheels came off. Cramping below the knee and in my left thigh set in as I started mile 12 and it was an absolute battle just to keep running. I was pretty much limping as I ran. It loosened up enough in the last mile that the limp went away. I crossed the finish line in 1:40:15 for a PR of just over 14 minutes! 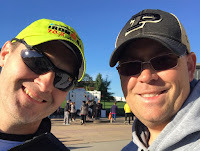 I’ve said it before and it’s worth repeating, getting connected with a good coach had a huge impact on this year, unlocking potential in swimming, biking and running that I hadn’t been able to do on my own. 3 PRs and 3 Age Group Podiums in the year I turned 40 are pretty good testimony to that impact. Check out Progressive Endurance CoachingA few folks have asked me just what kind of difference coaching made. I decided to pull together my strava data for both my training and my races and compare the averages year over year. Here is the data side by side with some commentary. Overall improvements were made in all 3 disciplines. It doesn’t necessarily show up on the bike due to the race strategy for the Half IronMan and a shift in consistency through the summer. My usual approach to the off-season is to sit around and do nothing for a few months, which pretty much leads to starting completely over every year. This year my focus will be on improving my diet and doing more strength training. They say you can’t out-exercise a bad diet. Well I have a bad diet and carry about 20 lbs more than I should. Considering that I’m probably leaving 1-1.5 seconds per miler per pound on the table I should be able to improve in running with an improved diet. The strength training should help correct any weaknesses/imbalances that I have and help me hold them off. The only planned event so far is the KDF Marathon. It’ll be my first attempt at a full marathon and my focus for training beginning in December. I’m sure I’ll add some other events to the calendar in the coming months.